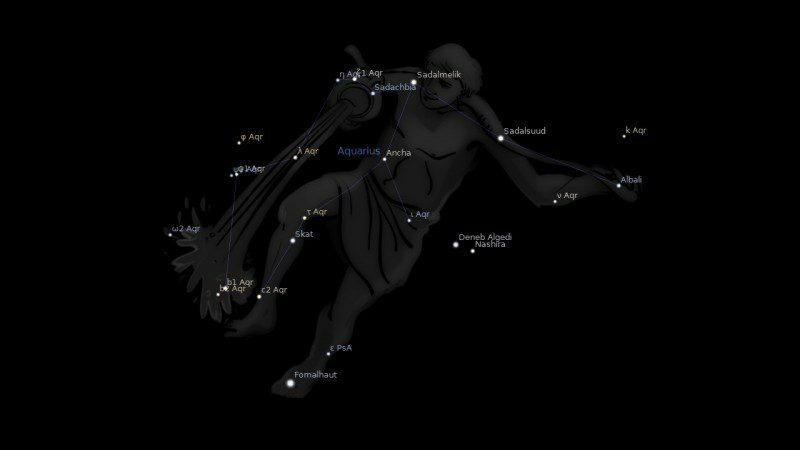 Fixed star Sadalsuud, Beta Aquarii, is a 2.9 magnitude pale yellow double star in the left shoulder of the water bearer, Aquarius Constellation. The traditional name Sadalsuud comes from the Arabic expression سعد السعود (sa‘d al-su‘ūd) which means the luck of lucks. Another Arabic term used was Nir Saad al Saaoud which means the brightest of luck of lucks. The Latin translation being Lucida Fortunæ Fortunarum. β Aquarii. Sa’adalusu’ud, ‘Luckiest of the Lucky’, is one of the two most important stars Aquarius stars, included in every worthwhile astrological list. It is universally recognised as a Sign of Good Fortune for all who have it prominent in their horoscopes, though like all such promitors, it should not be abused. Gamblers especially should beware of taking foolhardy chances when planets in transit or progression on their horoscopes are aspecting it by squares, oppositions and the like. 1. Fixed Stars and Constellations in Astrology, Vivian E. Robson, 1923, p.28, 202. 3. The Living Stars, Dr. Eric Morse, 1988, p.105, 110. How interesting. This prompted me to go to ASTRO.com and it turns out my natal chart has this star at 22 Aquarius, exactly conjunct my Mercury @22 Aquarius and sextile my POF @23 Sagitarius. I was in a workshop long ago when the two facilitators looked up about a star in my chart and sighed a relief as they said ‘oh, the luckiest of the lucky!’ I loved hearing that, but often wondered what they were referring to….For years I never thought of googling it and now I find out while I am researching what the fixed star in Aquarius is, in a totally ‘unrelated story’. And now I know. They were talking about Sadalsuud! It’s conjunct my Chiron. Opposite Uranus and square Jupiter. I must say I love Chiron. I love being with people when they pass over and I love finding deep healing through painful emotional situations, even if only in retrospect! But reading some of the descriptions above surely does not sound much like ‘the luckiest of the lucky! I’ll just keep on making up my own luck. And be eternally grateful for the much luck that does seem to always be coming my way…. Hi. I am a follower of this blog, and I like the interpretations it offers. In the case of Sadalsuud, the luckiest among the lucky ones, I must say that an astrologer explained to me that I have this star in conjunction with my natal Jupiter, which is at 20 degrees of Aquarius, but it is also on the cusp of my 8th House In any way, now that I think about it, in higher studies, a Jupiter theme, I am offered opportunities and recognition from teachers and classmates. What do you think about it?